Demographic changes and new technol­ogies are the two most important factors that will shake up the retail business in the coming decade. Millennials in particular, are demanding consumers who expect more selectivity, personalisation and customi­sation in their products and services, as compared to previous generations at the same age. According to the Department of Statistics, Singapore has approximately 1.07 million millennials in 2016, placing them ahead of 0.85 million baby boomers but behind 1.23 millions of Generation X. Inevitably, millen­nials are likely to form the largest consum­er group in the years to come, when they reach their prime working and spending years. Given their distinctive upbringing in the digital age, retailers will have to adjust and evolve quickly to keep pace with their changing needs, interests and tastes. New technologies are also vastly trans­forming consumers’ shopping experience. Today’s smart consumers are a lot savvi­er, after being exposed to a multitude of options offline and online and are more empowered to make informed decisions via “word-of-mouth” recommendations and online reviews; gone are the days when shoppers simply rely on recommendations by sales assistants at brick-and-mortar stores. Flyers and in-store advertisements are becoming a thing of the past. In a way, the traditional mode of cultivating customer relationship via physical stores is being disrupted. Millennials are capa­ble of completing any type of transaction from groceries shopping to bulky furniture through simple apps on a mobile device, without even stepping out of their homes. 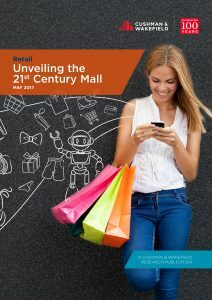 In this report, we highlight how we envision a 21st century mall would look like, sum­marised into 10 key traits.